To a Catholic, this must seem especially confusing, since we venerate Augustine as one of the Four Western Doctors of the Church and one of the greatest defenders of Catholic orthodoxy in Church history. Why then do Protestants make such use of him? Two reasons, mainly: First, because of Augustine’s tremendously imposing corpus of writing, it is difficult for the layman to comprehend the whole of Augustine’s work and get a balanced view on his beliefs on issues such as faith, grace, and biblical inspiration. It is worth pointing out that a few other heretical groups (notably the Jansenists) also misquoted Augustine in support of their heterodox teachings. This is compounded by the fact that Augustine modified some of his beliefs over time, as we see in his Retractions. This means that there is a greater likelihood that Augustine can be misunderstood. In this article, we will look at just one example of this, a text pulled from Letter 82 of St. Augustine to St. Jerome (c. 405) dealing with some questions about St. Paul's keeping of some ritual traditions of the Jewish law. In Chapter 1:3 of this letter, Augustine says, “For I confess to your Charity that I have learned to yield this respect and honor only to the canonical books of Scripture: of these alone do I most firmly believe that the authors were completely free from error.” Later in the letter, St. Augustine reiterates this point and adds that he is “bound to yield such implicit subjection as to follow [the Scriptures’] teaching, without admitting the slightest suspicion that in them any mistake or any statement intended to mislead could find a place.” These quotations have been used frequently by Protestant commentators against Catholics as alleged “proof” that Augustine taught sola scriptura. But do they really prove this? There are literally scores of quotes from Augustine that demonstrate beyond doubt that he firmly believed in the authoritative nature of the Church's Tradition and did not hold anything close to a Protestant belief in sola scriptura. Such quotations from St. Augustine’s other works allow us to get a more well-rounded look at his teaching and establish firmly that Augustine did not believe that the the Bible alone is the sole source of authority for a Christian. However, we have not dealt with the original quote from his 82nd letter where St. Augustine says, “For I confess to your Charity that I have learned to yield this respect and honor only to the canonical books of Scripture: of these alone do I most firmly believe that the authors were completely free from error.” If Augustine does not teach sola scriptura in this passage, then what exactly is he getting at? “You ask, or rather you give a command with the confiding boldness of charity, that we should amuse ourselves in the field of Scripture without wounding each other…On such terms we might amuse ourselves without fear of offending each other in the field of Scripture, but I might well wonder if the amusement was not at my expense. For I confess to your Charity that I have learned to yield this respect and honor only to the canonical books of Scripture: of these alone do I most firmly believe that the authors were completely free from error” (Letter 82:1, 2-3). As is often the case, the problem is one of context. When we read the entirety of St. Augustine’s letter, we see that he is saying nothing at all about the authority of Scriptures at the expense of Church Tradition or Church authority. He merely asserts that the Bible is to be preferred to the opinions of a private individual, which the Church would agree with. The problem is that the Protestant who attempts to use this citation to debunk the Catholic position does not really care what Augustine is getting at; they have no intention of understanding the subtleties of Augsutine’s thought, only of attacking the Catholic position. A verse that seems to support the Protestant position is found and then wrenched out of context to be used against the unknowing Catholic. 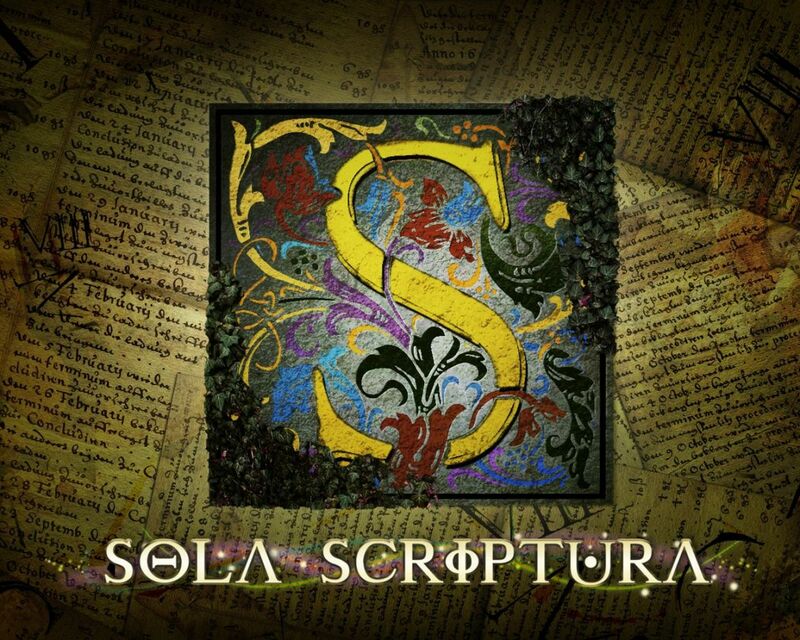 When one really takes the time to dig into the works of Augustine, or any of the Church Fathers, it becomes easily apparent that they did not believe in anything even close to the Protestant notion sola scriptura. Don’t be taken in by the novel idea that Augustine, Athanasius or any of the Church Fathers believed in the doctrines of Luther and Calvin. It simply isn’t so.